Once you have been selected by the Saskatoon Police Service, you will attend the Saskatchewan Police College for a training program designed to give you the skills you need to succeed. 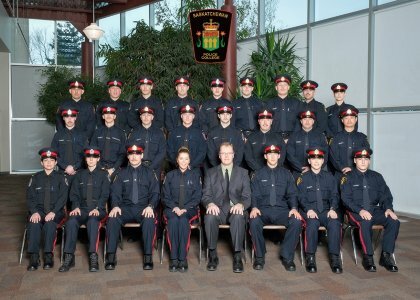 The first 20 weeks involve classroom instruction at the police college in Regina wages, room and board are provided by the Saskatoon Police Service. The next 24 weeks are dedicated to field training under the guidance of one or more experienced officers in Saskatoon. The final weeks of instruction will consolidate your academic and field training and prepare you to serve as a sworn member of the Saskatoon Police Service. Comprehensive information regarding the training program is available at http://www.saskpolicecollege.ca .